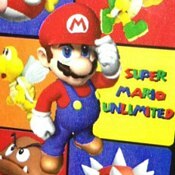 Description: Super Mario Unlimited is a very well done Mario Bootleg hack. A lot of jumping happens in this game. Jump over this and that and try to do it without falling down holes. Fun levels for sure though!